Yes, Brett J. Talley’s novel THAT WHICH SHOULD NOT BE has certainly earned all the hype it has received. It’s that good. Knowledgeable in the styles it emulates, stylish in the stories it brings forth. And there are more than one, four narratives are encapsulated by a framing story that also ties the others together, in a fashion similar to Arthur Machen’s The Three Impostors. The framing story features a common lovecraftian protagonist, an antiquarian type in search of a lost book that has apparently been discovered in a small town called Anchorhead. As he enters a local tavern, he’s invited to sit with a group of strangers who proceed to regale him with their stories. The first story, taking place in the great white north, is an enjoyble riff on Algernon Blackwood’s The Wendigo. The second story takes place in dark continental Europe and tells the story of travellers who end cooped up in a strange gothic convent during Walpurgisnacht. Blackwood’s Secret Worship sprang to mind, as well as Dracula. The setting and the mood of the stories is excellent, and both are told in a relaxed style slightly out of time, as if the stories were indeed penned back when Blackwood and Stoker were publishing their stories about one hundred years ago. By the third story the narratives begin to converge. The story takes place in a mental asylum, where a young doctor becomes aware of strange goings-on with the patients. And in the fourth story, we’re firmly back talking about the same things as the framing narrative, as a sea captain recounts the story of how he came to acquire the book that’s the cause of all this storytelling in the first place. As said, the stories are brilliantly executed. They’re not mere pastiches, more like lovingly crafted tributes that borrow the framework and some recognizable details from the stories by the old masters and then reinvent and rearrange the contents (something Lovecraft himself did all the time!). Throughout the novel the stories adhere to a subtle, no-nonsense style of a (supposedly) found narrative, a very common device in horror stories, especially lovecraftian ones, where by the end of his story the narrator usually hears strange scratching noises at his window, bringing the otherwise somewhat dry narrative to a visceral close. One of the problems with THAT WHICH SHOULD NOT BE is that by the end of the stories it isn’t content to just die horribly, but instead it starts delving into catacombs and travelling to a certain sunken city in the Pacific for a traditional good vs. evil smackdown. In other words, a collection of subtle horror stories becomes a pulpy globetrotting adventure in the vein of August Derleth. This isn’t saying it’s a bad thing, it’s just a jarring change of tone, that’s all. Derlethian pulp is after all quite enjoyable, in its sheer chutzpah. Another thing that somewhat lessens the experience is the use of overfamiliar names (from Dracula, from Lovecraft, from history), or the mention that the asylum in the third story is supposedly built on the ruins of Salem (a town that still very much exists). While the names are just labels, they are so incongruous with the otherwise stylistically conscious prose that I wondered if they were used on purpose, to signal the reader that the story shouldn’t be taken all that seriously and that it’s just a story, even if it’s told in a very solemn fashion. But these are minor issues. The storytelling itself is enjoyable, the plots are well-paced and the writing itself is top-notch in the genre(s) it seeks to emulate. 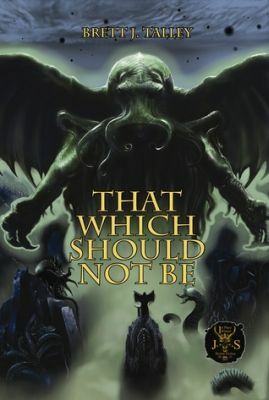 Perhaps with the Derlethian epic scope at the end it overreaches itself slightly, but on the other hand, by including that style as well as the others the novel manages to encompass most of the major strains of what we’ve come to understand as the Lovecraftian mythos, including the stories by the man himself, stories that inspired him, and stories that have followed his example. And that’s no small feat, no small feat at all.